Here is an electronic gadget that should thrill parents and truly upset every teen driver. The CarChip. Simple name to cause such a ruckus. What it does for parents - and against teens - is record the use of an automobile for up to 300 miles of driving data. This electronic gadget does the works - recording how the car is used and what has happened. Tie this in with the high-tech gadget of GPS cell phone (another subject and purchase) - and parents can keep a Big Brother eye on almost everything their teen does in life. Personally - I abhor this kind of development - just like I am fighting against AT&T/SBC for their complicity in giving their customer’s information to the NSA. The Fourth Amendment of the Constitution is being trampled by this administration - and no-one seems to care. Welcome to fascism and the loss of all your rights, teen and parent. But I digress. For all you parents who have a teen who is tearing the --- out of the family car and you can’t catch them at it - the CarChip may help. (there are certain situations where the modern high-tech electronic gadget does serve a purpose and come in handy - much to the consternation of the delinquent kid). and engine diagnostic trouble codes. Plus, if the car is involved in an accident, the electronic gadget CarChipE/X will automatically generate an accident log showing the last critical 20 seconds of speed before the crash. 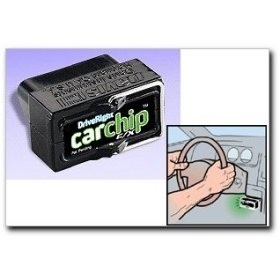 CarChip includes a data logger, software on CD, and USB cable for downloading data. The software is another one that is behind reality and requires Windows 98SE/2000/ME/XP and one USB port. (Of course MAC has expanded even more and with the new Excel chip, now MAC can run Windows. the problem is, all the old MACs run so well that it is hard to think of turning them in - just to run Windows. Oh, well.) But I digress. Again. There are a few vehicles in which CarChip does not function properly, and there are others in which CarChip may interfere with the normal operation of the vehicle. One should review the list of known CarChip Vehicle Conflicts and Exclusions before purchasing or using CarChip. There is an Important Safety Notice: CarChip 8221 has been carefully designed and tested to comply with the OBDII and CAN protocols used on most cars and light trucks sold in the USA, model-year 1996 or later. However, some vehicle models are not in full compliance with these protocols. In addition, the computer control systems on any given vehicle may be malfunctioning or out of spec, as may be the sensors used by these systems. Before purchasing and installing CarChip, be sure to review the list of known vehicle exclusions and anomalies (These are the normal CYA of any Manufacturer, and the job of any diligent consumer).